Ramboll as partners to SLA was assigned to carry out a visionary urban planning and climate adaptation project in Copenhagen. Last year, the project beat out 145 entries from the Nordics and won Scandinavia’s largest and most ambitious architecture competition regarding sustainable urban development, Nordic Built Cities Challenge. The World Landscape Architecture, who is a globally recognised ‘webzine’ honoured the team with first prize for their ‘The Soul of Norrebro’, for being a best practice example on providing climate adaptation and resiliency while adding social and recreational value. This means that this proposal will now be implemented in the Copenhagen neighbourhood Norrebro over the next two-three years. The project combines city nature, local community and smart cloudburst solutions. When the project is complete, Hans Tavsens Park at Inner Norrebro will act as a rainwater catchment basin during cloudbursts. The excess rainwater will be led via two streets into Peblinge Lake, and on the way, the water will be purified biologically by the city park greenery on two adjacent streets. Thereby the project will enhance the water quality in the Copenhagen lakes. 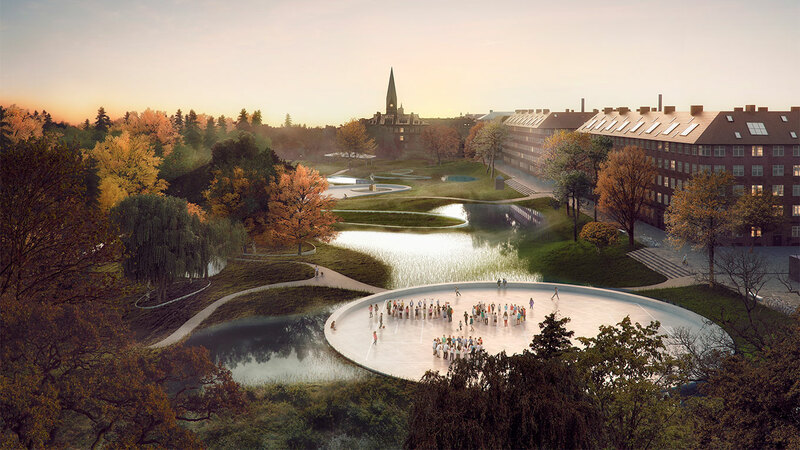 The project centres on the renewal and climate adaptation of Hans Tavsens Park and Korsgade in Inner Norrebro in Copenhagen. The 140 million DKK (20 million US Dollars) urban space project will be a flagship example of how cities can deal with cloudbursts in dense inner city neighbourhoods while adding unique social, cultural and natural values to increase the life quality of its residents.